many users may need to enable assistive devices and apps, but what was once called “Assistive Devices” and controlled within the Universal Access / Accessibility control panel has since moved to a new generalized location in OS X Mavericks. Let’s see how to enable it in the latest version of Mac OS X, and also how to control and modify what apps can use the Assistive Device features. 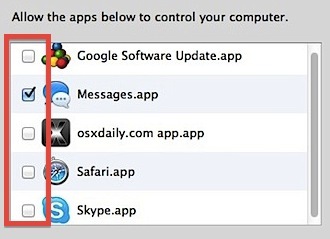 The list displayed shows exactly what apps can control the Mac using the Assistive Devices feature set. As mentioned above, this may include access to the camera, microphone, screen, keyboard, or other such functions of a Mac. If you see something in this list you do not want to have such access, or you don’t see an app you do want to have assistive access, you can easily control both, which we’ll cover next. Most applications that want access to the Assistive Device panel will request permission upon first launch. This arrives in the form of a pop-up dialog box with a message saying “Appname would like to control this computer using accessibility features.” with an option to “Deny” the request. Note that if you deny the app, you can add it again later or toggle the setting easily by going to the Privacy control panel. You may find some apps in the accessibility list that you did not expect to see here, and if you see something curious consider the features of the app that may request more control over the Mac in order to function. For example, many popular games will require access to the Assistive Devices abilities so that an online game can properly use voice chat or screen broadcasting. This is true with nearly all Steam games, ranging from Team Fortress 2 to Civilization V, and Blizzard / Battle Net games like StarCraft 2 and World of Warcraft. Note these games will continue to function without Assistive Access, but their feature set for online communication and sharing may be limited, and thus if you’re playing games and find the voice chat features aren’t working, this setting or app-specific access could very well be the reason why. The same usually applies to other apps as well, and similar fine-tuned control is now available to iOS devices as well for apps attempting to access everything from location data to the microphone and camera. 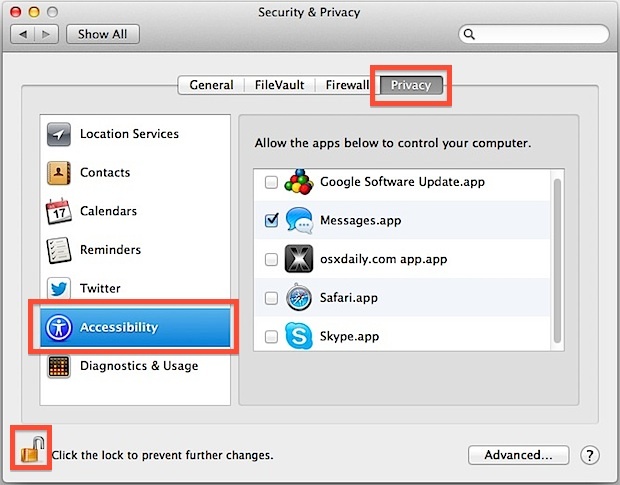 If you’re wondering why this feature is now in the “Privacy” control panel, it’s likely a more appropriate place considering the heightened abilities such apps and devices can have access to on a Mac. Additionally, becacuse the feature has wider spread usage beyond general universal access functionalities, it makes sense to broaden its controls to more generalized privacy preferences. It would be nice if some developers figured out where this is located. Their apps link me to the Accessibilty pref pane, which is NOT where I need to make the necessary selection. No, it’s not a huge inconvenience, but it’s still their responsibility to learn where the proper link is located. That is exactly the inspiration for this tip, it seems many apps send users to the wrong area which creates a lot of confusion as to how to turn on the assistive functionality. I’m having an issue when I try to add things to allow them access… I tried dragging them from Finder folder and from the Desktop to the accessibility list, but they won’t appear… Am I doing something wrong?